"Slip-On" Rocker Panel replacement sheet metal? Discussion in 'Body Work & Detailing' started by BonesDT, August 26, 2011. 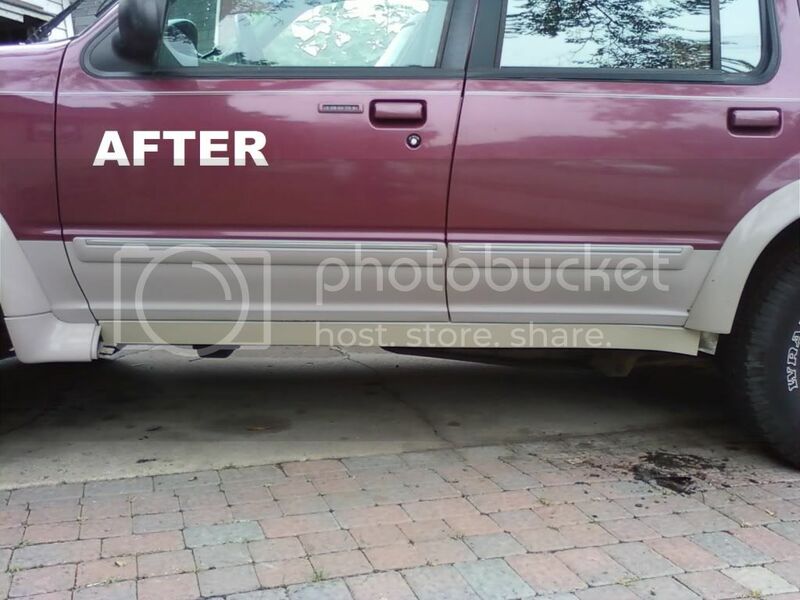 Fixing my rusty rocker panels is my first body work project. The only online places I could find replacement 2-door rocker panels was Raybuck & LMC, both are $40, but LMC's shipping is cheaper by about $2. I called a local place and they said they don't have anything. So I just received my LMC "rocker panel" [which by the way is made by CHL Auto Parts (LMC won't tell you who manufactures their stuff on the phone)]. I went out to my truck, granted it is pitch black out, but it did seem like the panel fit nicely OVER the rusted sheet metal. I want to do this repair the right way. Am I going to have fitment issues if I cut out the rust and weld this panel in as a REPLACEMENT? I'm a noob, I really don't want extraordinary fitment issues. Seems like I don't have much of a choice, since I'm banking on the Raybuck panels being the same exact thing. It is designed, as you noticed, to slip on over the existing panel. I would trim off the rusty parts that are left of the old panel, paint them to slow the rust return down, and then use weld-through primer to coat everything before you weld them on. 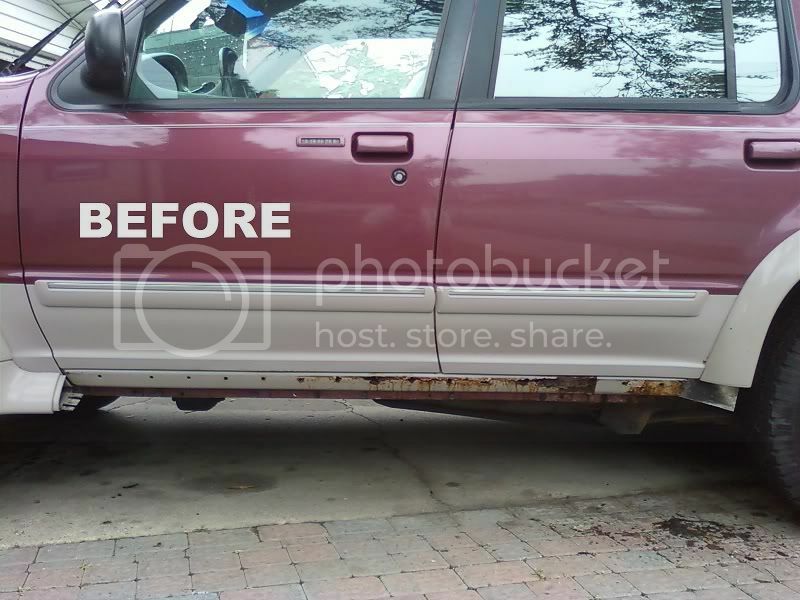 The primer will turn into a rust preventive coating where you weld, so that you don't have to worry about starting rust where you can not get to it. I am going to be installing some of these on our "X" once they get here. I found them on Flea-bay for $62 for the pair and another $10 for shipping. There was a listing for the 2 door panels on there, also. But did I order the wrong thing? I don't want to slip over, I want to cut out and replace with new metal. What would the pros use? Or is "slip-on panel" the same as "replacement panel"? If anyone has information on the lmc panels i would love to know too! I will probably end up replacing mine soon. Also, do you need to replace your inner rocker panels as well or do you just cut em out and leave em out? I have seen both ways but wanted to know which was the right way. If your looking for a quick and easy fix, I have it. I have aluminium panels bent to precise specs, and cover up that ugly rust. Makes it looks new again. Self tapping screws hold it in place. Popped your plastic trim back on, and your done. Would you happen to have any pics of those with the doors open? Can't view it on my mobile device. I know its an old thread but if you do a search for 'Browns of Two Rivers' they sell a lot of replacement panels for the Ex and Mountie's (some Mountie parts are referenced under explorer). I know some body shops swear by them because the panels are supposedly a thicker gauge then most replacements. My rockers were $60 a side. dont by that junk. alum siding for a house would work better. that has no structure to it what so ever. its like this. would you glue your rims on and not us lug nuts? no. find either a 4 door rocker and cut it down. Exactly - lipstick on a pig never made it beautiful. Sorry, but this is the dumbest thing i have ever seen.